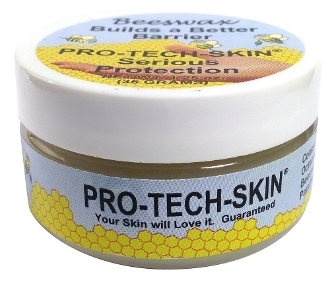 Pro-Tech Skin Cream is made from all natural unbleached Bees Wax ingredients. Pro-Tech-Skin has no perfume, protein, or vitamins. Use Pro-Tech Skin to create a natural barrier to help your skin retain it's natural moisture and repel sources of irritation from multiple hand washings, dehydration, soaps, household chemicals, friction, and weather extremes. If your hands and feet are dry, red, raw, chapped, cracked, blistered, and callused, use Pro-Tech-Skin. Your hands, feet and skin will look healthier immediately and continue to improve as natural healing occurs. Apply to hands, face, feet, knees, elbows, and lips. Only a light application is necessary because Pro-Tech-Skin contains no water, only ingredients that resist the harmful effects of washing and abrasion. First, wash and dry the area. Then immediately apply Pro-Tech-Skin. Apply before exposure to grease, dirt, glue, paint, or other toxic chemicals your skin is exposed to on a daily basis. It will protect your skin the same way Sno-Seal protects your leather. Made from all natural Bees Wax ingredients. Great for super dry, chapped, callused ,cracked, splitting, or red irritated skin. Helps reduce itching from eczema, psoriasis and improves appearance. Recommended by Allergists and Dermatologists.